by MERKS: Day 37, outfit 37. Today, I'm wearing my brown vintage lammy coat. Combined with a basic black V-neck T-shirt and a skinny jeans. 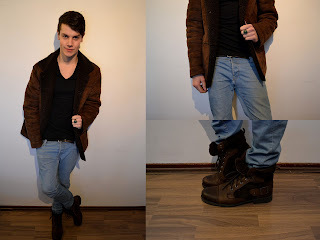 It's snowing outside, so I'm wearing my lovely brown leather shoes with fur.